They are the perfect miniature version of the big cakey Pennsylvania Dutch sugar cookies seen around here at farmer’s markets and bakeries – soft and airy with a just-sweet-enough frosting. They are e-a-s-y to mix up and bake. If you bake even occasionally, you probably have all the ingredients in your pantry or fridge. Their potential for decorating possibilities is endless. For anyone who likes messing with colored frosting, sprinkles, non-pareils, and sanding sugar, these cookies are the bomb. They are a cornerstone in my husband’s family’s Christmas culinary traditions. I’m sure there would be grave disappointment if Grandma ever came to Christmas brunch without her anticipated cookies; some might even think the earth would cease rotating on its axis. The recipe is my mother-in-law’s and I’m grateful she shared it with me. 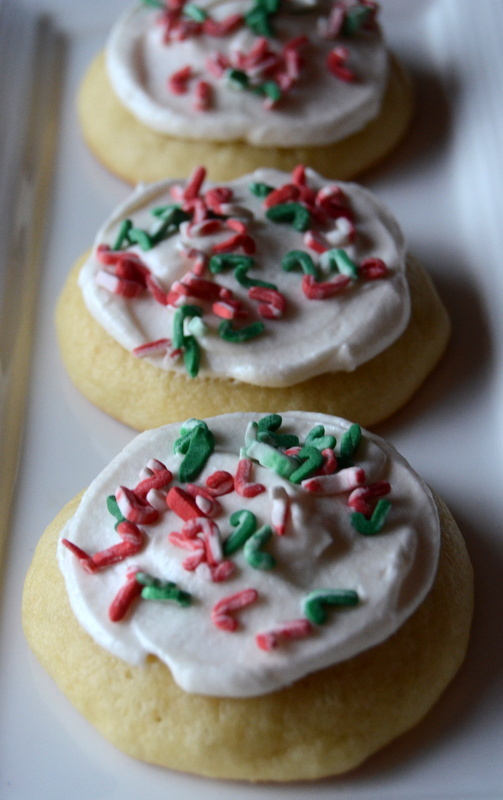 Even though they make adorable Christmas cookies, they aren’t just for Christmas. 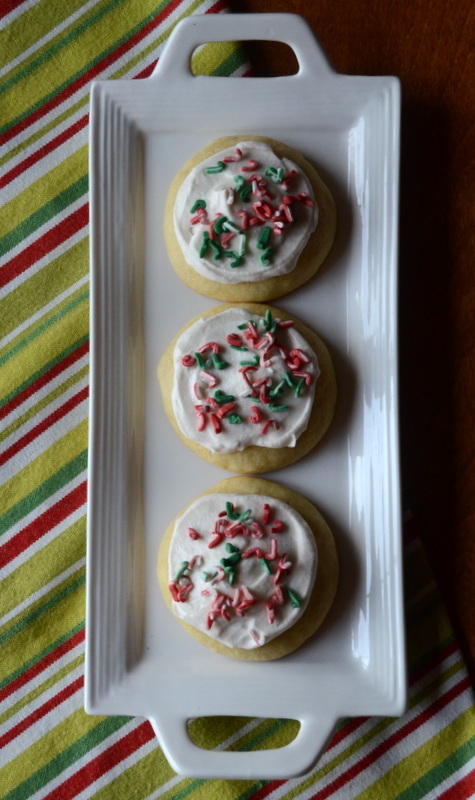 Seasonal sprinkles make these an adaptable cookie recipe for any time of year. All of the above statements are true and interesting. However, the most relevant and compelling thing I will say, as I sit here stuffing yet another sugar cookie in my mouth, is that you need to make these cookies just because they are so. darn. good. Seriously. Preheat the oven to 350°. Cream the sugar, butter, eggs and vanilla for 7 – 8 minutes. Whisk dry ingredients in a medium bowl. Add dry ingredients to the creamed mixture, alternating with the sour cream, beginning and ending with the dry ingredients. Gently fold each addition into the batter. Place cookie dough (still in mixing bowl) in the refrigerator to chill for at least an hour. This step is optional but the cookies are plumper and spread less during baking if you do it. It will not change the flavor or texture of the cookie at all so if you are pressed for time, skip this part with a clear conscience. Cover cookie sheet with parchment paper. Drop cookie dough by rounded teaspoons onto the cookie sheet 2 inches apart. Bake for 10 – 11 minutes or until lightly browned. Let cookies cool on baking sheet for about 3 minutes and them move to cooling rack. Allow cookies to cool completely. 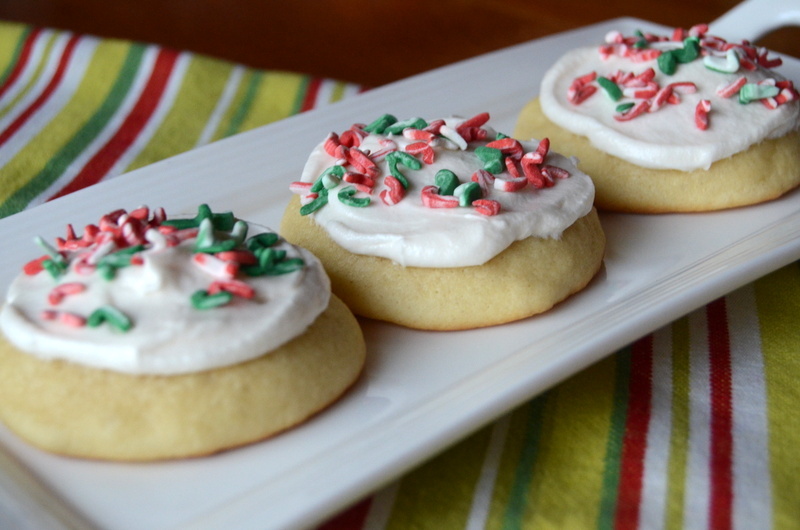 Frost cookies with butter frosting. Makes approximately 4 1/2 dozen cookies. Beat butter and sugar in a small bowl with a hand mixer. Add vanilla and milk. The amount of milk will depend on the consistency you want. I prefer a thicker frosting so I usually use about 4 Tablespoons. Add the milk by tablespoonfuls so that you have better control over the frosting’s consistency. Beat until smooth and well blended. Add food coloring now, if desired. Apply frosting to cookies. Add any embellishments – sprinkles, jimmies, non-pareils, sanding sugar, etc. – at this time. Pour yourself a glass of ice cold milk. Pop a cookie (or two) in your mouth. Mmmmmm… See what I mean? So. Darn. Good.